Need to add an event? Click here to get started. Want a PDF walkthrough of the new Event Creation process? Click here to download. 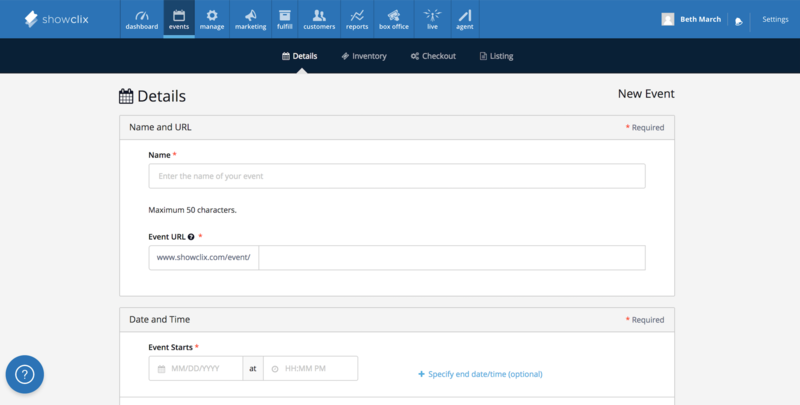 Click the Events tab in the Admin. Click the Create Event button. Name. Enter the title of the event. This will be visible to any customers and visitors on your event page. Event URL. Enter a customized name to attach to the event page's URL. Use what’s suggested or enter your own. We’ll automatically check it against our database to make sure your URL is unique. By default, this name is the event's title without spaces or punctuation (i.e. http://www.showclix.com/event/showclix-event). What kind of event is this? From the dropdown selector specify the category of event. This only affects the event's placement in general search results on ShowClix's event search index. Event Listing Messaging. Specify if the event is Ticketed or Registration. This option affects some of the messaging your customers will see during the checkout process (e.g., "Register" or "Buy Tickets"). Age Restrictions. Select the applicable age restriction for admission to the event. If none exists, select All Ages. You can also select Other to specify a particular age and enter a short note about the age limit. Privacy Settings. Select each of the privacy options you wish to enable. These options determine the accessibility of the event information in search engines and the seller homepage. Hide from ShowClix search results prevents your event from appearing as a result in our website’s search engine. Hide event on seller homepage removes your event from your seller homepage (i.e. your account’s main event calendar). Click Save & Continue to advance to Step 2: Inventory.